These vegetarian stuffed peppers are one of our favorite summer dinners! Filled with an herbed orzo & kale salad, they're light, healthy & easy to make. Stuffed peppers are one of my go-to summer dinners. In fact, they’re so easy that when I posted this picture on Instagram last week, I got tons of emails asking for the fully measured recipe. Ask and you shall receive, so here it is: my current favorite recipe for vegetarian stuffed peppers. 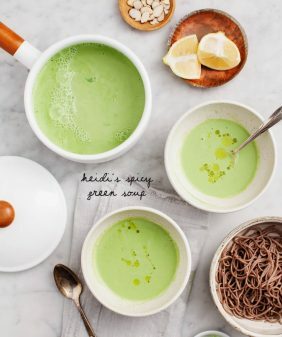 But don’t let the measurements fool you – feel free to eyeball your ingredients if you don’t feel like breaking out the measuring cups. 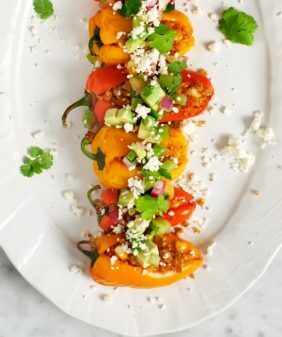 This vegetarian stuffed peppers recipe is simple and customizable! If you don’t have orzo, use couscous. Gluten-free? Millet or quinoa would also work well in place of the orzo. And basil, oregano, or your favorite herbs would be a good substitute for the mint. I put some chopped kale in mine this time, but you can add spinach, roasted broccoli, or zucchini instead. And if you don’t have red peppers, go find another recipe! (Kidding: you can use Anaheims, poblanos, or any mild stuff-able pepper – even mini ones!). Fill your peppers, smother them with cheese, and bake until the cheese bubbles on top. 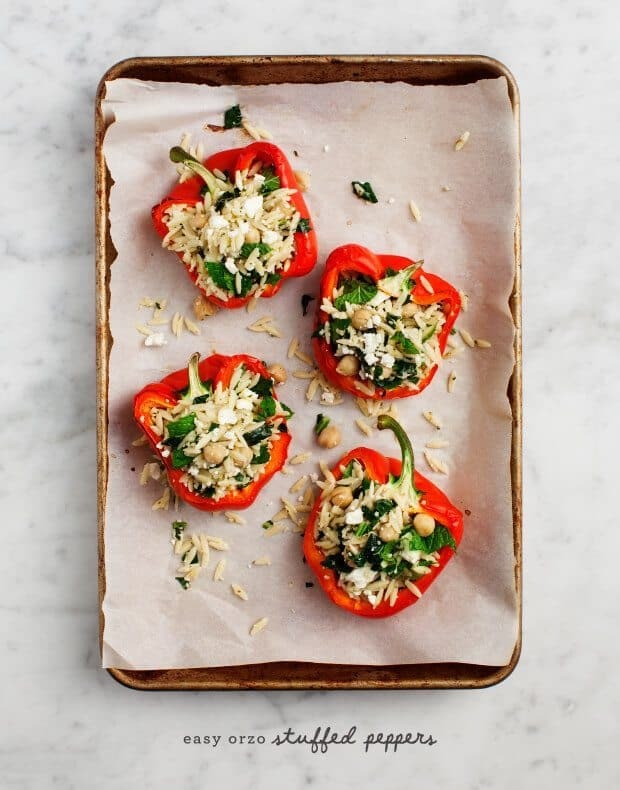 For a lighter version (pictured), skip the melty cheese but roast the peppers before filling them so that the orzo filling doesn’t dry out in the oven. Once you make these vegetarian stuffed peppers, please let me know how they turn out for you in the comments. I hope you love them as much as we do. Enjoy! This vegetarian stuffed peppers recipe is one of our favorite summer dinners! Filled with herbed orzo and kale, they're light, healthy & easy to make. In a pot of salted boiling water, cook the orzo pasta for about 7-9 minutes, or until al dente. Meanwhile, roast your bell peppers. Slice them in half and remove the seeds and ribbing. Then, drizzle each half with olive oil and sprinkle generously with salt and pepper. Place cut side up and roast them for 20 minutes or until they become soft and golden brown around the edges. Next, prepare your filling. In a large glass bowl, combine the olive oil, garlic, kale and chickpeas. When your orzo is al dente, drain it and add it (warm) to the bowl and toss. Stir in the feta cheese, lemon juice, lemon zest, mint, red pepper flakes, and generous pinches of salt and pepper. Taste and adjust seasonings. Finally, fill the red pepper halves with the orzo salad and serve. Optional: add a layer of white cheddar or pepperjack cheese on top of your stuffed peppers and pop them under the broiler (or a hot hot oven), until the cheese is bubbling and browned. Optional: mix together the yogurt sauce ingredients and serve on the side. 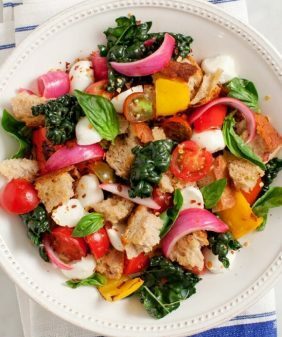 Make it vegan: skip the cheese and add something tangy like olives or sun dried tomatoes. This is pretty much perfect summer eating in my book. Simple but just so delicious. 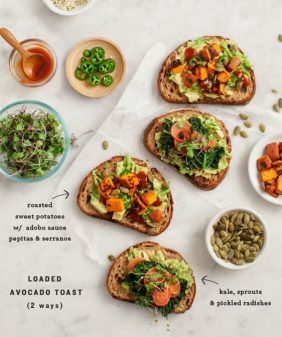 This looks like perfect end-of-summer eating…healthy, light and filling. I can’t wait to make! Adding it to menu this week! Also, gluten free orzo is now available in most markets. I stock up on it when I see it. 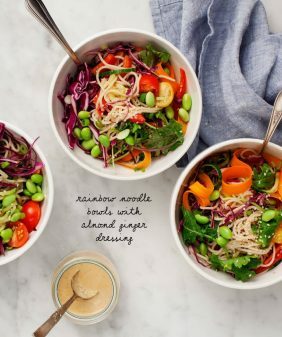 oh you’re right – I have been seeing gluten free orzo – so exciting how many new GF pastas are out now! They look just so good!! These look amazing, I will definitely try them. I usually cook stuffed peppers a bit differently. I don’t precook the orzo (or rice) I mix it with the blended flesh of tomatoes and a bit of vegetable broth and fill the peppers up to 2/3rds and then let it cook in the oven inside the peppers with those liquids. How clever to roast them first instead of later. My mom used to make stuffed peppers all the time, but I was never a huge fan of them- they were always filled with ground beef and rice, which was never my thing. This might be the recipe to change my mind. 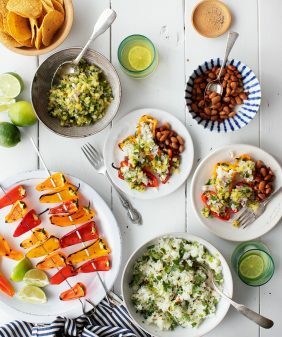 Love this end of summer dish! These look incredible! I’ve never put chickpeas in stuffed peppers, what a great way to add protein. I’d eat these for dinner anytime! Do you think I could get a similar result by putting all of the ingridients inside the pepper and just steaming it for an hour or so? Made this for my boyfriend and I and added chicken sausage (he isn’t a big vegetarian fan) and used quinoa instead of orzo. It was amazing and we both loved it and we can’t wait to make it again. I never rate or comment on recipes so this is really a testament to how good it is.